This finely executed drawing was completed towards the end of Meninsky's one year scholarship studying at the Slade School of Fine Art, where his contemporaries included David Bomberg and Jacob Kramer, and is likely to have been an entry for a Slade summer composition. 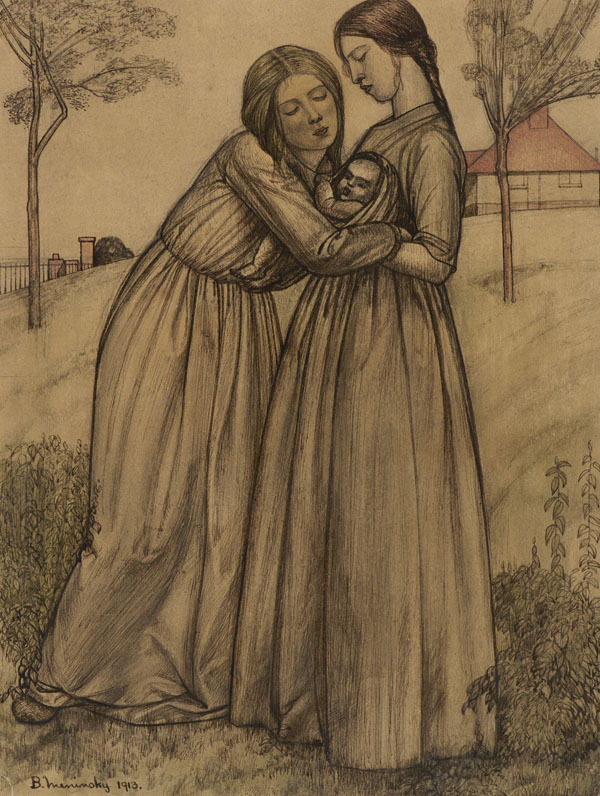 Kramer and Clare Winsten (who left the Slade in 1912) both completed similar compositions on the mother and child theme. The subject of maternity inspired many of Meninsky's works c. 1918-20, particularly following the birth of his first son, David, in 1918, after which the artist became almost obsessed with the image of motherhood. ‘Mother & Child Drawings’ was the title of his first solo show at the Goupil Gallery in 1919 and in 1920 he published ‘Mother and Child: 28 Drawings by Bernard Meninsky’, with a text by Jan Gordon.